Nagios is an open source monitoring tool for the network devices. It uses snmp protocol for the monitoring of network devices. 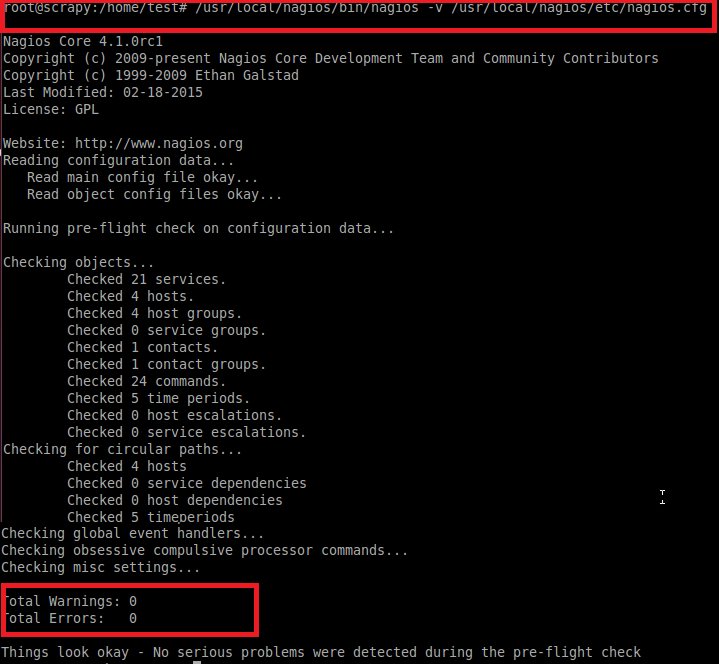 Nagios Core supports configuration from CLI which is not easy for new users. 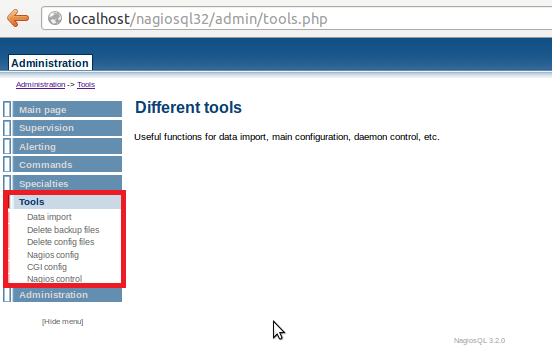 NagiosQL is plugin which provides GUI interface for the configuration of Nagios Core. 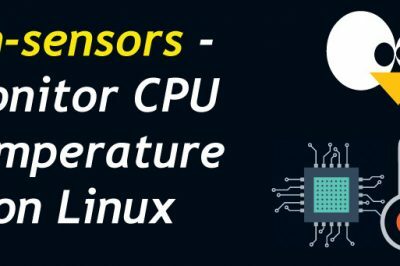 In this article, our focus is installation of NagiosQL and we assume that Nagios Core and net-snmp is already installed on the monitoring server. We have VM ( 3GB RAM and 80GB HD space) with Ubuntu 14.01 LTS OS installed on it. Nagios Core and Net-snmp package are already installed on it. 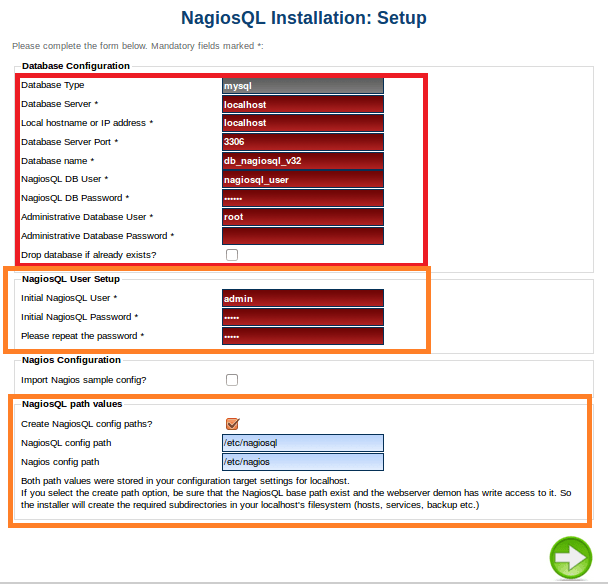 In this article, we will learn installation of NagiosQL , its integration with Nagios Core and status of different objects of VM on Nagios Core. Now copy this .tar.gz file in the /var/www directory (we assumed that apache web server is already install on the machine) and extract it with following command. Type following address in the web browser and web page similar shown below will appear in the browser. 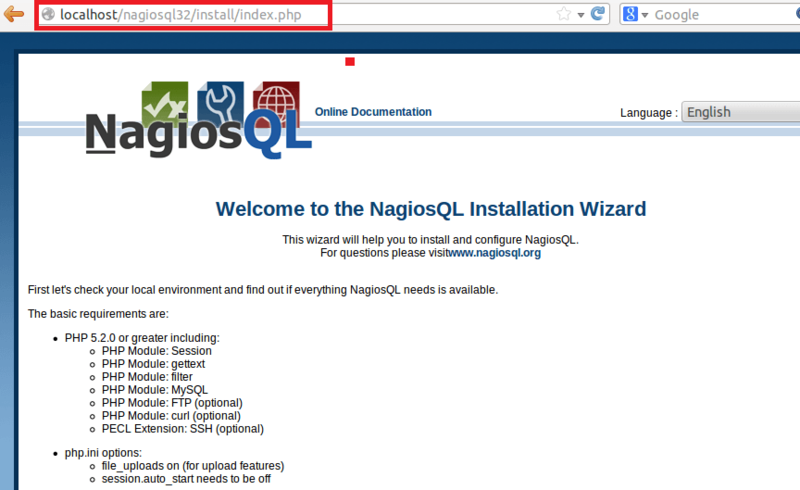 For the installation of NaqiosQL, click on the "Start Installation" button at the bottom of NagiosQL main page which is also shown in the following figure. 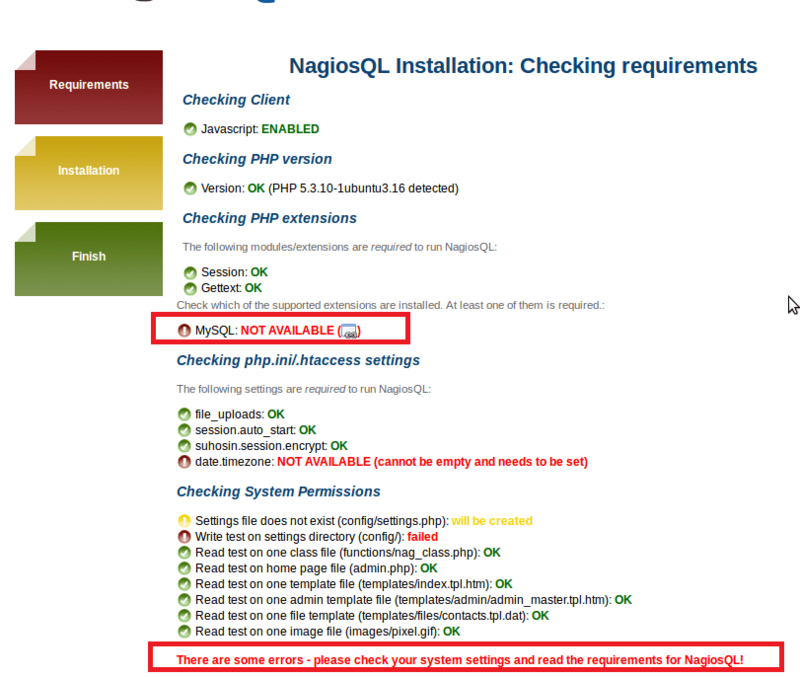 Next page checks the requirements of NaqiosQL plugin. 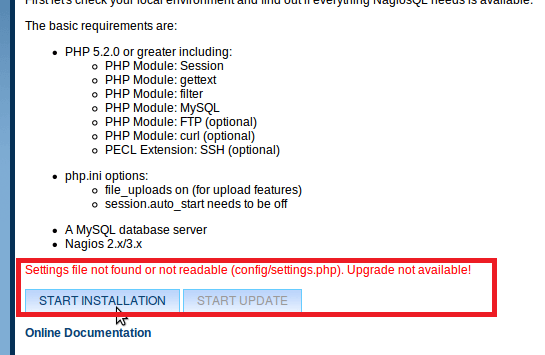 Usually it shows errors on this page regarding the permission of Nagios Core files, time zone setting in php.ini file etc. Nagios main configuration files are under /usr/local/nagios. Time zone error is shown in the above figure. It can be fixed by changing following line in /etc/php4/apache2 .Remove the comment ";" from date.timezone =America/Chicago option and save it . After fix on this page, a green arrow button will appear at the bottom right corner of the page. Click Next to move on the next stage. Next stage is the creation of database for the NagiosQL plugin. It uses the database for the storage of configuration for Nagios Core. 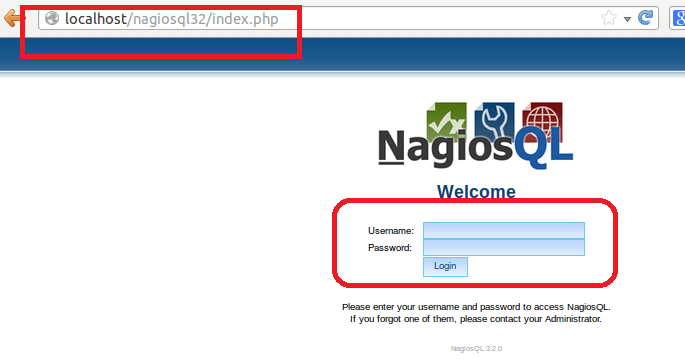 On this page, set log in details for database ,enter credentials for NaqiosQL admin user and set configuration path for Naqios Core and also create directory for NaqiosQL configuration. Following window will appear after the successful creation of DB on the machine. 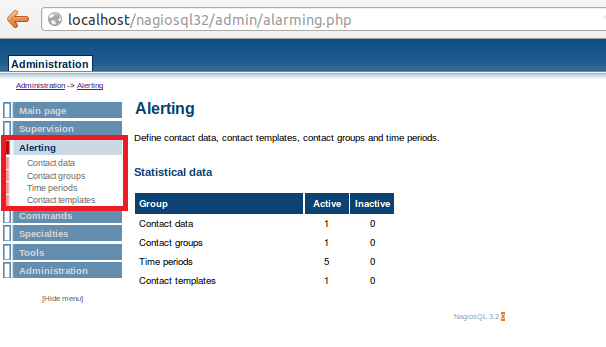 NagiosQL administration main interface page after successful log in is shown below for further configuration of Nagios Core. Introducing some of the nagiosQL menus for your reference. 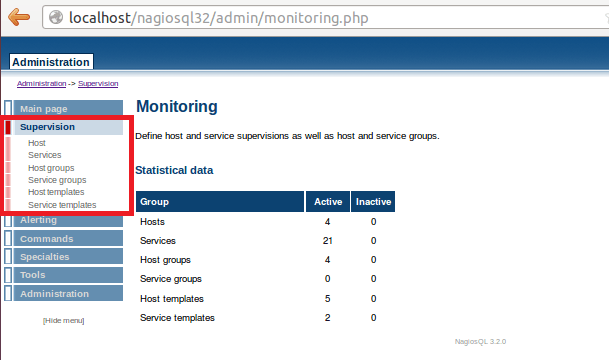 This menu provides the configuration of Hosts and Services for Nagios Core which is shown in the following figure. In this menu, user can configure the contact information of System Administrator and time periods for alerts. This menu provides the format and parameters of different command which are used by the Nagios Core monitoring software. Importing of Data, backup files, configuration of Nagios Core , CGI configuration and syntax checking is available in this menu. 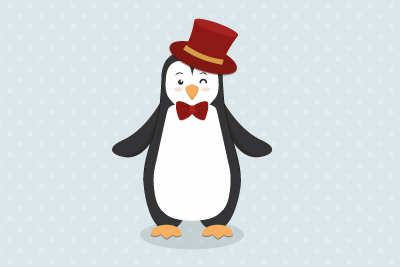 This menu provides the setting for the NagiosQL plugin. User can change the password, add user for maintenance of server, logs and setting etc. 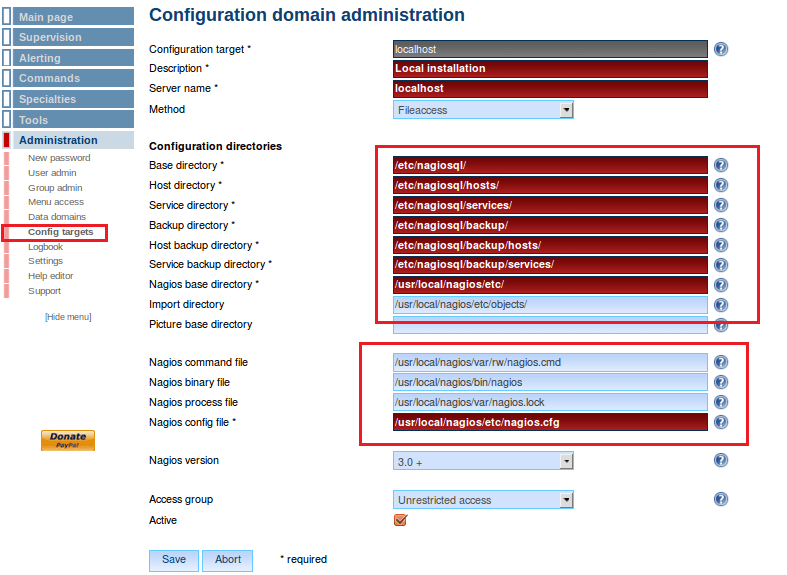 In the config target sub menu, we have to set NagiosQL files as a Nagios Core configuration which is shown below. 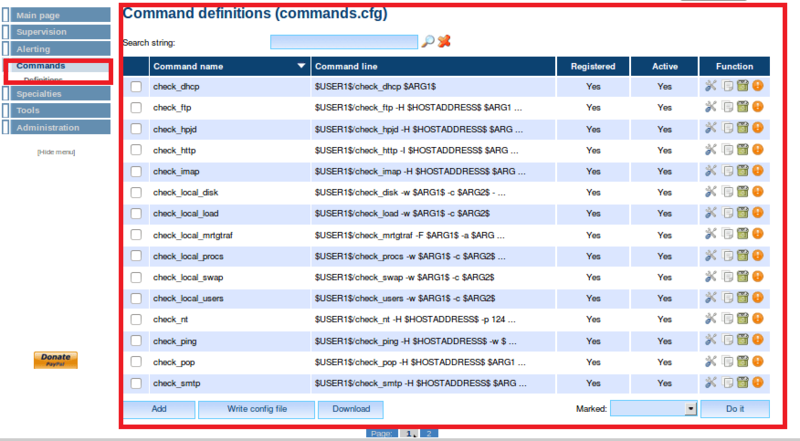 we also set the path of Nagios command file, binary file, process file and main configuration file (nagios.cfg). After path changes in NagiosQL front end, verify the configuration files from command line and restart the nagios daemon. 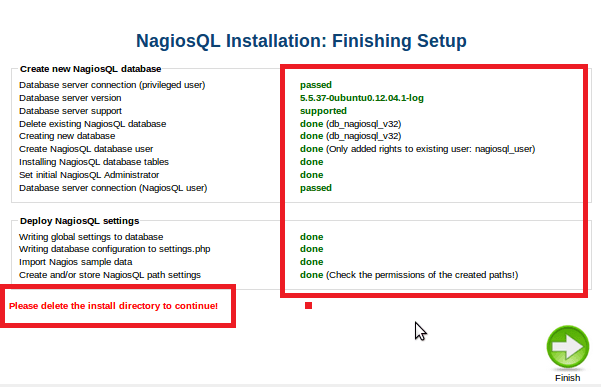 In this article, we explain the installation of NagiosQL which is graphical configuration tool for well-known monitoring tool Nagios Core. Nagios uses SNMP protocol (support all versions) for monitoring of network devices such as servers, router and switches. NagiosQL web interface provides an easy way for complex configuration of Nagios. 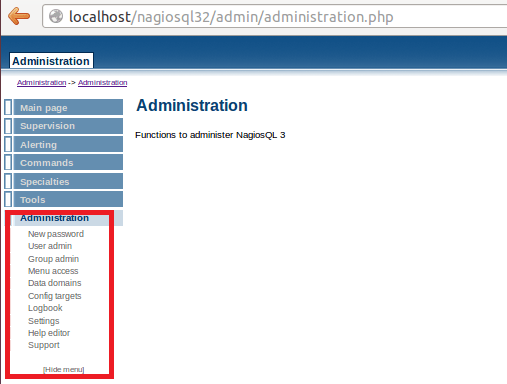 NagiosQL uses database on the back end for the permanent storage of configuration. I am trying to create user in nagios core for views particular host and services but, its not authenticate proper way so please help me. Not trying to be a jerk just which one should I use? Sorry to bother again which version of Nagios Core do you use for this installation? That is mistake. You can check in the screenshot that version is _320. Hi, I followed the guide and successfully installed NagiosQL. But when in login prompt, credentials is not working. Not sure why. Thanks!